MythCon Ain’t Over – Part One » « Where Have You Been? This is like a tangent of a tangent of a tangent. Remember that Mythcon boondoggle? Not everyone agreed it was bad, for instance Melissa Chen thought it was a defining moment for her. Stephanie Zvan agreed, but in a cursed-monkey’s-paw sort of way. 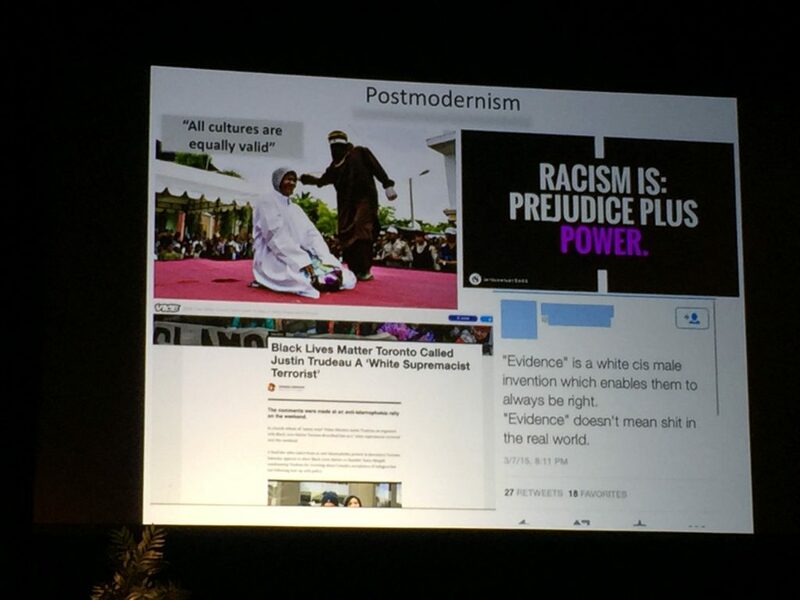 In the process, Zvan linked to two tweets by someone in attendance, who grabbed some of Chen’s slides. … Yeah, no. 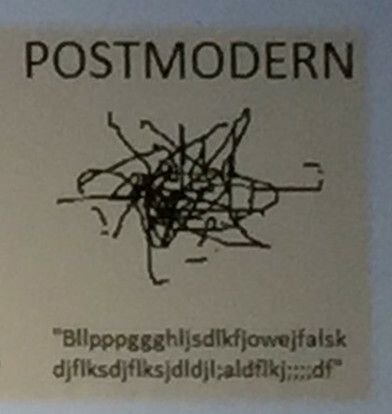 Unfortunately, I keep seeing this misrepresentation of post-modernism in the atheo/skeptic community. It’s worth spending a bit of time to write up an explainer. 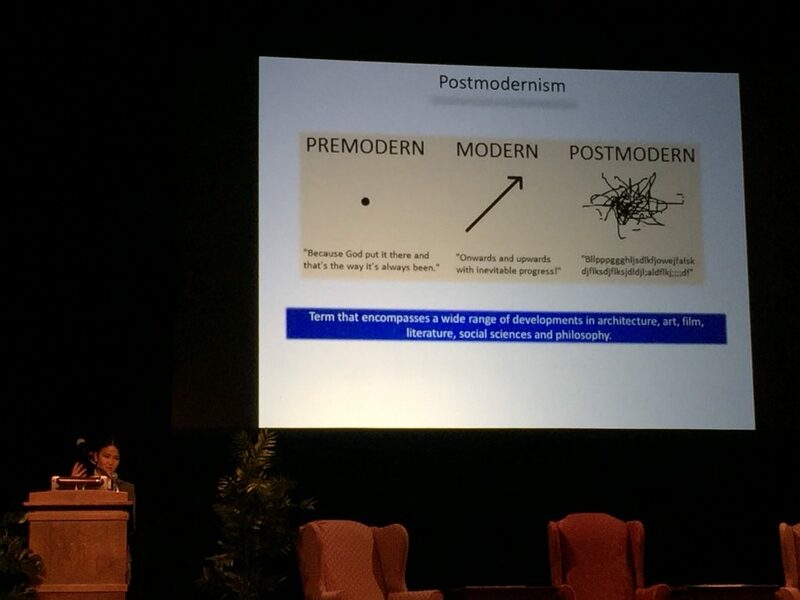 You can’t understand post-modernism without first understanding the second half of it, modernism. Chen has the broad brushstrokes of it correct; modernism rejects prior systems of knowledge, and views society as continually progressing. But there’s a bit more to it than that. The “modern” in “modern art” isn’t temporal, it refers to a specific art movement. Jackson Pollock is considered a member, as was Picasso, Marcel Duchamp, and Paul Klee. The latter even wrote a book on the movement, in fact. The creation of a work of art … must of necessity, as a result of entering into the specific dimensions of pictorial art, be accompanied by distortion of the natural form. For, therein is nature reborn. What, then, are these specific dimensions? First, there are more or less limited, formal factors, such as line, tone, value and colour. Of these, line is most limited, being solely a matter of simple Measure. Its properties are length (long or short), angles (obtuse or acute), length of radius and focal distance. All are quantities subject to measurement. There’s an interesting tension there: modernist artists rejected past knowledge, but sought to create a new knowledge of their own. The path was laid by breaking down art into its fundamental atoms, and building back up. You see this reflected in other modernist works again and again. For instance, here’s a few quotes from Finnegan’s Wake, by James Joyce. Joyce is rejecting prior knowledge of how to build a plot, characters, and even words, and forging his own path. There are still words present, though, and an intent to convey meaning, even if no two people can agree on what that meaning is. Similar things happened with modernist architecture: materials such as steel and continuous panes of glass, new innovations, are used almost exclusively. Curves, slabs, and patterns are prominent. These buildings generally appear cold and aloof, held up by theories which aren’t necessarily obvious but obviously exist. Progress! Except it isn’t progressive, in some ways. Modernism isn’t well-defined, because the only commonality is the rejection of what came before. There isn’t an over-arching theory behind it all, hence why artists as diverse as Jackson Pollack and Andy Warhol can both be considered “modernist.” There’s also a clear power structure here: take Duchamp, for instance. If there are disagreements on whether an object is art, whose opinions matter most? Artist Marcel Duchamp devoted part of his career to investigating this very issue. He created a type of object he referred to as ‘readymades’ in order to challenge prevailing notions of what art could and could not be, as well as writing “The Creative Act,” in which he details his views on the relationship between artists and their audience. Duchamp concluded that the audience has a monopoly on the definition of art. He reasoned that an artist can make the claim that their creation is a piece of art, but if this claim is rejected by the audience, the piece will ultimately not be recorded within the history of art. However, as this work will demonstrate, the opinions of the audience can be manipulated and controlled, whether it be by the artist him/her self or others. The issue of who controls art is significant because of the greater control art grants them over society at large. His infamous urinal was defended as a work of art because “He CHOSE it,” and therefore it was art. Modernism got rid of the gods, but replaced them with equally dictative rules and laws. Science became a source of worship. The later nineteenth century is the age of modernity as an achieved reality, where science and technology, including networks of mass communication and transportation, reshape human perceptions. There is no clear distinction, then, between the natural and the artificial in experience. Indeed, many proponents of postmodernism challenge the viability of such a distinction tout court, seeing in achieved modernism the emergence of a problem the philosophical tradition has repressed. This is where post-modernism steps in. As a reaction to modernism it inherits the same vagueness, but if there is a unifying factor it’s the critique of modernism’s axioms. Is newer always better? Must the relation between artist and audience be so dictatorial? And aren’t we just replacing old gods with new ones? A text is made of multiple writings, drawn from many cultures and entering into mutual relations of dialogue, parody, contestation, but there is one place where this multiplicity is focused and that place is the reader, not, as was hitherto said, the author. The reader is the space on which all the quotations that make up writing are inscribed without any of them being lost; a text’s unity lies not in its origin but in its destination. Inside, it has a ramped floor conveying an ancient Egyptian aura, while its main staircase quotes the Vatican’s Renaissance Scala Regia. Outside, it has a clock that quotes the Fascist-era main post office in Naples and is surmounted by a turret that looks like a submarine conning tower. And yet it was a rebuke to all those funless corporate modernist buildings teeming with identical Le Corbusier chairs and sharp-suited drones. You are allowed to think “No. 1 Poultry” is ugly (and you wouldn’t be alone). You are supposed to analyze and critique the work, take it apart and put it back together again in a better way. Deconstructionism (or sometimes just Deconstruction) is a 20th Century school in philosophy initiated by Jacques Derrida in the 1960s. It is a theory of literary criticism that questions traditional assumptions about certainty, identity, and truth; asserts that words can only refer to other words; and attempts to demonstrate how statements about any text subvert their own meanings. Although Derrida himself denied that it was a method or school or doctrine of philosophy (or indeed anything outside of reading the text itself), the term has been used by others to describe Derrida’s particular methods of textual criticism, which involved discovering, recognizing and understanding the underlying assumptions (unspoken and implicit), ideas and frameworks that form the basis for thought and belief. A modernist holds up science as the ultimate arbitrator of what is true; a post-modernist looks at the replication crisis, who our “ideal human” is in scientific studies, and the philosophy underpinning scientific methods, and asks for something better. I like to think of post-modernism as skepticism re-discovered by non-skeptics. It can most certainly get things wrong, especially when it amounts to blind opposition or the lack of something (sound familiar?). But when done right, it encourages critical thought and challenges orthodoxy, and isn’t afraid to turn that critical lens on itself. Postmodernists define themselves against “modernity” (itself conceived as an extension of the Enlightenment) by rejecting grand theories that attempt to “totalize” knowledge. Postmodernists reject teleological and deterministic explanations of historical and social phenomena. This was a reaction to the popularity of deterministic theories in scholarly thought in general during the 19th and early 20th centuries. Examples of historical determinism included the conceptions of a linear progression of societies from small hunter-gatherer bands to “civilized” states in anthropological thought or from capitalism to communism in Marxist thought. Applications of biological determinism to social policy, such as scientific racism and eugenics, were also (at some point in time) included in modernist thought. You can see how that can be both appealing and frightening to skeptics. If you view science as a sacred cow, if you think progress is inevitable, then you are a modernist and post-modernism is your enemy. And there is perhaps no better way to critique you than point out that, thanks to a lack of critical thinking, you’ve mixed up post-modernism and modernism.